internalize a truly Christian world view. Placing a child in a Christian school is one of the biggest decisions parents can make. We believe parents are looking for a nurturing and formative experience in an environment which shares values similar to their own. 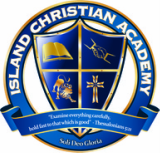 Island Christian Academy (ICA) welcomes the opportunity and awesome responsibility of partnering with parents to educate their children for the glory of God. With this in mind it is important to understand our positions and beliefs at ICA. Island Christian Academy has made a firm commitment to God and faith in Christ. Students study the Bible and relate it to every subject. They are encouraged to apply these principles to their own lives and to look for opportunities to serve the Lord. The academic emphasis is to create passion for learning with a reverence for God. We endeavor to develop basic skills as a foundation of knowledge that will serve each student throughout life. We also want them to learn how to acquire knowledge, have an inquiring mind, think critically and solve problems. Our mission is to equip students to deal with the world. Ideas and practices in opposition to the Christian faith will be considered in the classroom as they relate to the subject being studied. The goal is to develop the student's ability to see the world through a biblical lens. ICA endeavors to help each student realize his/her full potential. As a result, each student is held to a high standard of self-discipline. Students are expected to listen and to respond to each other with an attitude of love. ICA recognizes the need to provide proper balance among spiritual, academic and physical activities. The school endeavors to educate the whole person without neglecting any area or emphasizing one at the expense of another. Island Christian Academy is a non-denominational school with a desire to enter into training and nurturing partnerships with parents and churches of various backgrounds. We believe truth is derived from the Word of God as presented in the Bible and teach basic Christian doctrine that would align with the beliefs of most evangelical believers (see Statement of Faith).